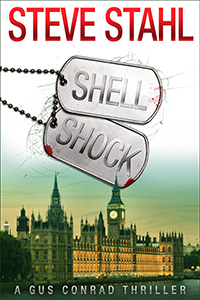 Shell Shock is my debut novel, part thriller and part historical fiction. This novel is about PTSD (post traumatic stress disorder), how it has been misunderstood throughout history, and how it impacts present day military servicemen and women. From the shell shock of World War One to the PTSD of our current troops returning from Iraq and Afghanistan, warriors have always experienced psychological reactions to combat. My novel traces two stories. One is the true saga of a British soldier during World War One who got shell shock, was treated and then sent back to battle only to have his symptoms of shell shock recur, so he was ‘shot at dawn’ as a coward by a firing squad of his own army. His case and hundreds of others like his were in truth covered up by the British government for 75 years following the end of World War One and have only recently come to light, resulting in modern pardons and a recent memorial erected to them. The second story is a fictional tale based on actual patients I have seen as a psychiatrist. This is a modern story of an American soldier deployed to Iraq, who developed PTSD and who died of an apparent suicide after returning home to Fort Hood in Texas. But was it suicide or murder? My protagonist, a modern day psychiatrist at Stanford University, is accused of murdering this soldier, who was also his patient. In order to find the real killer, my protagonist has to trace the story of shell shock in World War One through British army records in London and Cambridge in order to find the real killer. But will he find out the truth before he is killed himself? The military, the field of psychiatry, and many in society have long confused psychological reactions to warfare with cowardice. That is one of the main themes of this thriller. Cowardice has traditionally been defined as the opposite of heroism. The notion of a hero is used by armies to get their soldiers to fight, with risk takers glorified by their actions in combat. Those who are fearful or who hesitate are denigrated as cowards, sometimes using psychiatric diagnoses such as shell shock or PTSD as pejorative slurs to insult them. Instilled into the concept of the ideal warrior is a value system that puts heroism above life itself. On the other hand, cowardice is equated with lack of ‘manliness,’ lack of moral fiber, the equivalent of weakness and worst of all, caused by the most tainted condition of all: mental illness. And it works. For the past century, about as long as there has been a formal discipline of psychiatry within medicine, the armies of the world have used psychiatrists to equate cowardice with mental illness in an attempt to enhance fighting spirit and acts of heroism. Shell Shock explores this sad fact, and shows through the discoveries of my protagonist, a psychiatrist and a modern day ‘hero’ of another sort, that Armies have always exploited the stigma of mental illness to weed out the weak, and deny respect and honor to those who won’t fight to the death. Today, many soldiers with PTSD are denied psychiatric treatment and a pension as well. We discover in Shell Shock how the bias against psychologically wounded soldiers and the equating of this mental illness with cowardice was much more overt during World War One. Today, there may not be firing squads in the U.S. Army, but Shell Shock reveals how the modern army too often can give mere lip-service to patients who are psychologically traumatized by warfare. This is exemplified by the true story of well publicized shootings and other problems uncovered in Army warrior transition units at places like Fort Hood today. Meanwhile, Shell Shock probes what could happen if the worst of the excesses of bias against psychologically wounded warriors are not addressed by military psychiatry that desperately needs modernizing.